Before the team hit the field on May 30, 2017, TDS stepped to the pitcher’s mound to present a check to the Juvenile Diabetes Research Foundation (JDRF) for $950. It was opening night for the Madison Mallards, a summer collegiate league baseball team based in Madison, Wis. 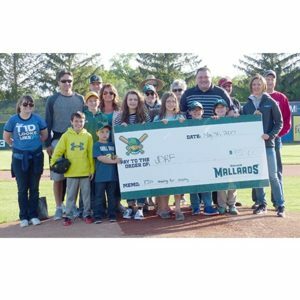 The donation was for each base stolen by the Mallards during the 2016 season — 38 bases stolen equals $950 to JDRF! A TDS representative presented the donation to a handful of area adults and children affected by type one diabetes. Congratulations to JDRF (and the Mallards for stealing so many bases)!